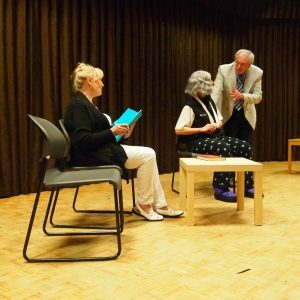 In addition to the usual theatre based productions in Calgary, Confederation Theatre Society has been active in writing and producing shorter one act plays specifically for seniors. We have traveled to seniors venues in Calgary and in other communities in Southern Alberta. Confederation Theatre Society is proud to be presenting a series of lectures at the Kerby Centre for Seniors. The first was on September 18th, 2018. This series will review the history of drama, types of drama, acting and writing. All participants will be expected to perform on the stage by the end of the course. On October 10th, 2018 Confederation Theatre will present a brief performance of some of their popular skits to an invited audience at the Kerby Centre. This will be, in part, a promotional event to attract seniors to attend further courses in 2019 on drama and its techniques. On November 16th, 2018 Confederation will be presenting a Murder Mystery Dinner Theatre at the Kerby Centre entitled “Audition for Death” written by Alan LeBoeuf and Paul Brown. Details will become available shortly. Confederation recently traveled to Lethbridge on Friday, July 27th 2018 at the invitation of a seniors group in that city. Our cast involved three actresses from Lethbridge who had reviewed the scripts but had never rehearsed in person with our Calgary personnel. Everyone was well prepared though, and the large audience loved the show. The cast included Marie Gomez, Bev Pickell and Louise Arsenault from Lethbridge as well as Terri Ager, Alan LeBoeuf and Paul Brown from Calgary. “Thank you for coming! The residents really enjoyed it and wouldn’t mind you all coming again sometime!” Randi Stretch, Fun Manager– Seasons Lethbridge Gardens. Following the success of that performance we now have a branch in Lethbridge. The Lethbridge crew are now recruiting actors and actresses. There is a particular need for actors. If you live in the Lethbridge area and would like to act, please contact Carl Sigurdsen at carl.sigurdsen4@gmail.com. In early 2016, we were approached by Montgomery Seniors to perform at their lunchtime meeting at the Montgomery Community Association. We agreed and wrote six short plays to perform. 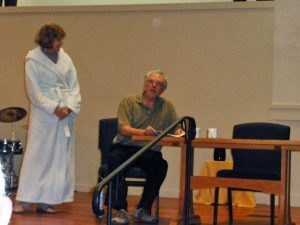 The performances included both drama and comedy. After the performance in Montgomery CARYA’s (Formally Calgary’s Family Services) elder abuse group asked us to perform for them. They wanted the performance to include a short play about elder abuse to bring awareness of the often hidden problem. We wrote a short play on this troubling topic which was performed in February 2017at the Central Library.John Dutton Theatre. CARYA asked us to perform our elder abuse play again on June 15th 2017 (World Elder Abuse Awareness Day) at the John Dutton Theatre. We happily agreed to do this. On June 6th 2107 we performed at the High River United Church, as a part of High River Senior’s Week celebrations. In March 2018 our performed in the Carstairs Community Hall. In May 2018 we performed at the Grace Lutheran Manor and they were kind enough to ask us back to perform again. At the end of May 2018 we performed for the Greater Forest Lawn+55 Society as a part of their birthday celebrations. In June we were hosted in Didsbury to perform for their Senior’s Week celebrations. The success of our Outreach Program for Seniors demonstrates the desire in the community for access to live theatre. In addition to our Outreach Program, we welcome Seniors to all our in-theatre performances as well. We will perform anywhere at any time of the day, in the morning or in the afternoon. “I wanted to thank you and Confederation Theatre group again for such an amazing performance. “The clients, staff and volunteers from the Adult Day Programs in Calgary Rural South, thoroughly enjoyed the performances by the Confederation Theatre for our annual Seniors week celebration. It was something new for them and they felt it was an awesome experience. The acting was terrific and professional. The variety of humor and drama was excellent. 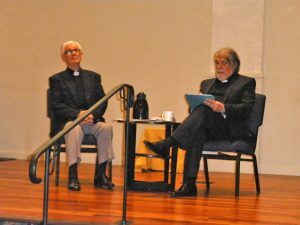 It was also a wonderful way to bring about the awareness of elder abuse in this type of play – which gets the point across without them having to feel uncomfortable as they possibly would in an open discussion session but it does open the door for such a discussion as well.